Interview by Hatchet culture editor Karolina Ramos. D.C.’s live music scene didn’t die with go-go and 80’s punk — it’s alive and well in the vibrant funky, jazz rock of B Side Shuffle. 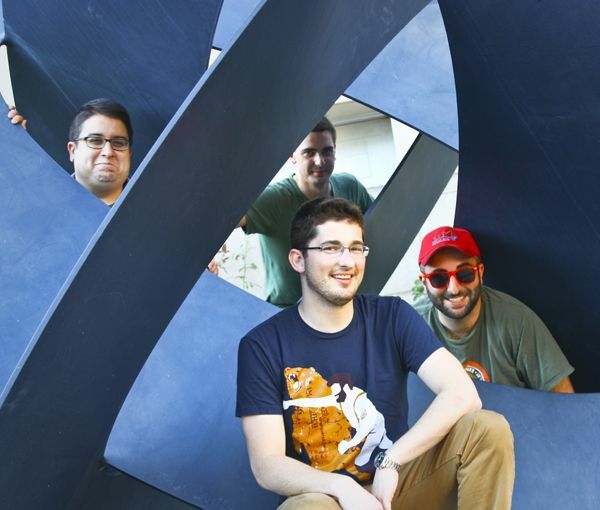 The Hatchet caught up with guitarist and singer Geoff Browning, bassist Carter Jones, drummer Jasper Drisko, GW Law School alumnus and guitarist Nick Sus and manager Max Gigle to talk about the band’s nascent days recording in kitchens, festival hopes and D.C.’s music legacy. The band kicks off its fall tour at Bayou tonight, and tickets are $5. Hatchet: Your sound is diverse. Do you all have similar music backgrounds, or do you each bring eclectic tastes? Jones: We all have different interests, and it’s nice when they wind up aligning. Like, “Oh, you really like Muse! I really like Muse, too.” Or the Red Hot Chili Peppers, reggae. We’ve all been playing for at least a decade and have a range of band experience. Sus: Our sound reflects our attitude of not taking ourselves too seriously. We take music seriously, but we don’t think we’re like these artistes. We’re able to focus our energy on the creative process and not how we’re going to make money. Browning: We started playing in my kitchen, and we outgrew that very quickly, and signed a lease on a dedicated practice space in the city. We could go there and play as late as we want and as loud as we want. Browning: Every time someone would knock on the door and we were practicing I would thank them for not being the cops. Hatchet: You’re now really promoting yourselves. When did you decide you wanted to be more than a casual band? Drisko: If we were going to do something like this, we wanted to do it well. Browning: The lightheartedness, that applies to the way that we perceive ourselves, and that’s the frame of reference with which we approach big decisions, but we don’t make decisions in a reckless way. Once we got out and started playing shows and people started reacting to it well, we wanted to do more of that and keep on improving. Sometimes our imaginations outrun our fingers when we’re writing, but that’s led to all of us becoming better musicians. Hatchet: In some cities, it’s not so much who’s playing, but the fact that any live band is playing that people appreciate. How do you market yourself in a city like D.C. that doesn’t have that vibe? Sus: A lot of people who come to our shows aren’t the type that go out and see live music on a regular basis. In that sense, we do want to fill a space in D.C. that other bands don’t really occupy right now, that of a good time band where you don’t need to know the songs ahead of time, whether you’re a professional or a college kid. Drisko: We’ve observed that our music appeals to the politicos, working professionals as well as the hipster subset demographic, so everyone is able to have fun and enjoy it, and it’s cool when some of those different scenes collide. Hatchet: D.C.’s music scene is most readily associated with specific eras — with 1970’s go-go or punk in the 1980’s. Is D.C. still a music-city? Gigle: A number of venues have cropped up recently. Rock and Roll Hotel is only six years old, H St. and U St. are re-envisioning where they’re coming from artistically. I think D.C. has a pride in its music, it’s just been kind of dormant for the past 15 years. Sus: D.C. actually has a great music scene. The bands are really good people, everybody knows everybody. If we need equipment in a pinch, we usually know friends to call. Browning: There are a lot of people in D.C. and have a blast dancing to a DJ, so it’s not quite as often that people go out and see a band that delivers the same kind of good time and the same kind of party. I think categorically, we may be competing, or at least occupying a similar kind of space as DJs moreso than other bands. Hatchet: So what’s next, what’s coming up for you guys? Browning: By next summer, we want to be able to share our music at festivals like Firefly, Bonnaroo, All Good. We want to put out songs that people really enjoy to the point where, from a curatorial standpoint, they want us to come put on a big show. We want to earn a spot at those festivals. I’d love to be able to take a little part of D.C. to these festivals, because D.C. has a lot of fantastic bands.